"Action Cuts is very much up to date and the material here would work brilliantly in stylish action scenes or montages." Action Cuts is the latest addition to Ueberschall's Elastik-based 'Inspire' series of sample libraries. Unlike the majority of the Elastik libraries, which follow a construction-kit format, the Inspire series is a little more freeform. There is no neat, pre-rolled, set of musical sections from which to build a song structure. Instead, you get a musically themed collection of loops with greater freedom to mix and match. Given that Action Cuts is, as the title suggests, aimed mainly at media composers working to picture (where a song structure might not be what's really required for a particular musical cue) that is, of course, perfectly sensible. Action Cuts provides 1.2GB of audio spread across more than 800 loops and samples. Aside from a very small 'Demo' selection of 'Inspire Kits' that demonstrate the kinds of things that can be created with the content, the bulk of the library is split into three sections: Drum Kits, Drums and Instruments. The Drum Kits section contains a selection of complete drum beats, several bars in length, with both a pre-mixed loop and the same performances for each individual drum so you can remix as required. In the Drums section, as well as a small selection of additional full kit loops, you also get a hefty collection of individual drum loops covering kick, snare, hi-hat and ride. These can be combined in all sorts of ways and, with the editing options offered by Elastik, make for plenty of options in building new drum performances. Also in this section are collections of drum sound-effects loops (all sorts of processed drum loops that make for great ear candy) and a small collection of drum breaks (mainly rolls and stops). The performances are Big Beat and Breakbeat-inspired: funky but with plenty of punch. The final section contains the instruments and is comprised of a collection of guitars, basses (electric and synth), synths, sound effects and vocals. There is some great stuff amongst this lot: clean and distorted bass riffs, a broad range of guitar riffs (clean, overdriven and wah-wah for example) and some great electronica-style synth phrases. The other highlight is the talkbox-processed vocals, which are very cool. The promotional blurb suggests that the library references the sound of 1970s crime shows, and I can see what Ueberschall are getting at. However, don't buy this expecting a retro vibe or an orchestral score. Action Cuts is very much up to date and the material here would work brilliantly in stylish action scenes or montages. For scenes such as car chases or banks being robbed, mesh a few of these loops together and you'll have it covered. And while the absence of construction kits requires a little more work on behalf of the user, the cohesive nature of the material means this is still a pretty straightforward task. 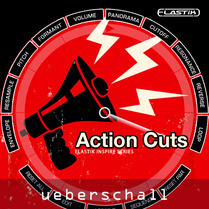 If you need to add a dose of cool 'rocktronica' to your composer armoury, then Action Cuts is just the thing.